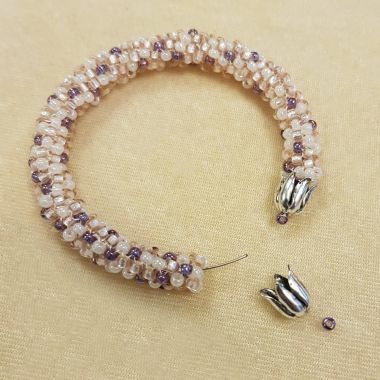 This super cute bracelet combines a simple tubular peyote stitch with memory wire to make a pretty beaded bangle. This design is great for making with different sized seed beads for a thinner or chunkier look. It's also perfect for gifting, as the memory wire will adjust to the wearers wrist size. Try making yours in different styles with your left over materials. You could make a striped or checkered peyote pattern with your favourite size 8 seed beads! 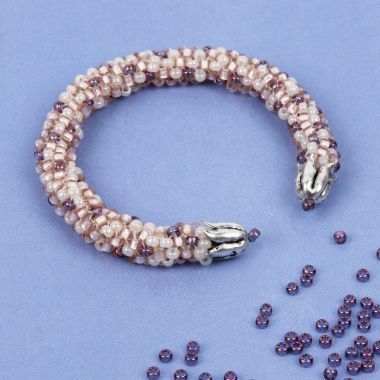 Take an armspan of thread and add 8 x size 8 seed beads. Thread through all the beads again, and the first seed bead a 3rd time to make a circle. 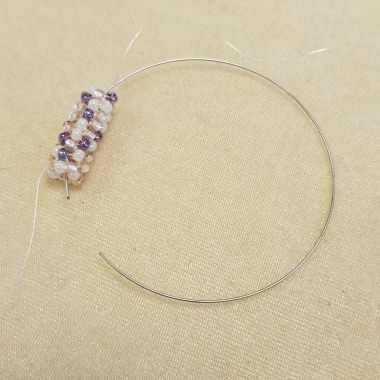 Pick up 1 x seed bead, miss a bead on the original circle and thread through the next. Repeat 3 more times so you have 4 seed beads making a new row on the outer edge. 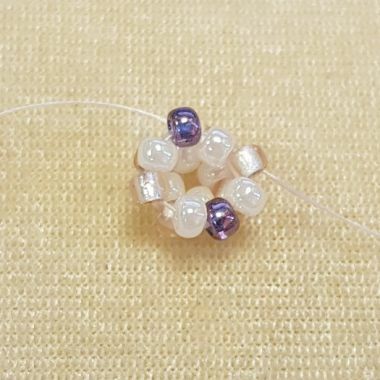 Thread through this 1st new seed bead added at the beginning of this step. 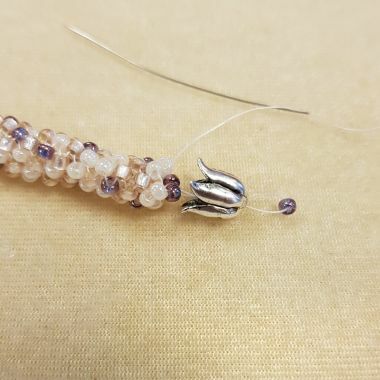 Pick up 1 x seed bead and thread through the next outer seed bead added in the last step. Repeat around the circle, adding another 3 seed beads. You will continue to add 4 new seed beads on each row until you have finished. This is what your beadwork will look like loosely strung. Pull the thread tightly to bring the circle into a tube shape. This will get easier to hold as your tube gets longer. Continue to add 4 seed beads, then 'step up' through the first seed bead added to start your next row. Continue your pattern as you would like. I chose to add my beads randomly to make a speckled bangle. Cut a loop off of your memory wire coil. Cut your loop so that each end of the wire is almost touching (a little closer than shown in my image) This is so it stays on your wrist more securely and has less of a gap to fall off if you have small wrists. 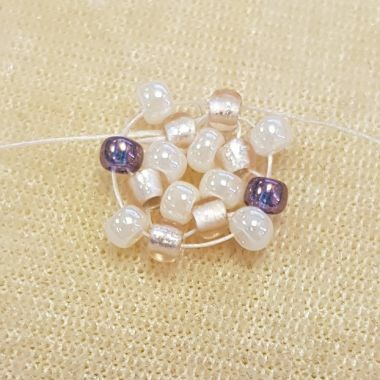 You can work with your beads around this ring of wire or take it off and thread it on carefully at the end of your design. Continue to add more rows of beads until your piece is as long as your memory wire and covers it from end to end. 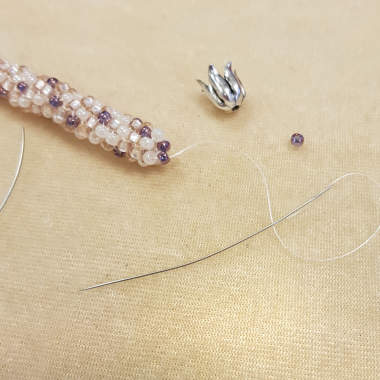 Once you have finished your last row of beads, pick up 2 seed beads and thread across to the other side of the circle on the end of the tube. This will pull the end of the tube together. 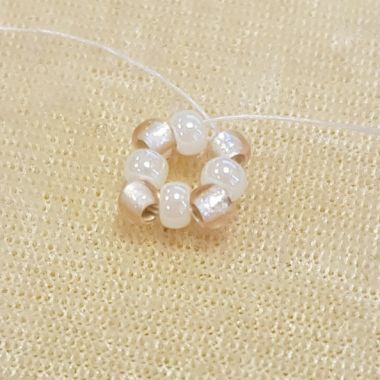 Thread around the circle of beads on the end and exit through one of the 2 seed beads in the middle. Thread up through the bead cap, through a new seed bead and back down through the cap. Thread through the beadwork and pull the bead cap securely onto your beadwork. Weave your thread into your beadwork, knotting along the way. Continue to weave around your bead tube until you are confident your bead cap is secure on the end and your work won't unravel. Trim off the excess thread when you are happy. 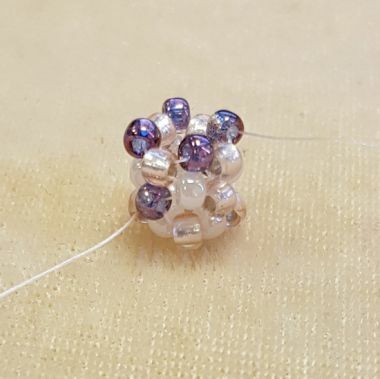 Repeat this on the other end of your design and attach the other bead cap with a seed bead at the end. 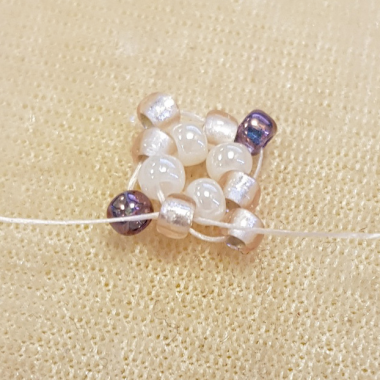 If you memory wire pokes through the hole on the beadcap, try adding a few drops of glue to secure it in place in your design or add some thicker glue to fill the beadcap hole, so it can't come through.